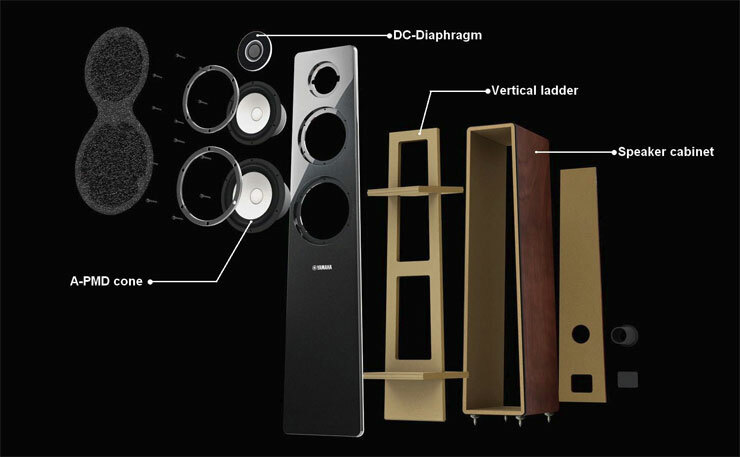 A floorstandlng speaker designed for superbly natural sound In the tradition of the Soavo series. Casual yet authentic, as amiable as an old friend, as new as the next generation. deep and tight bass, and a sense of rich detail and warmth. A world of sound that deeply satisfies, and is sure to fire your imagination. There's an organic feeling to the design of the NS-500, almost a sense of creation by nature. The rounded-corner design does away with sharp edges. Like a violin, the construction focuses totally on sound quality. Like a piano, the front baffle of the assembled unit is coated with in a lustrous glossy finish. And a choice of three colors assures a match with any decor. The NS-500: an expression of pure Yamaha craftsmanship. The voice coil for the tweeter Is wound directly over the aluminum-magnesium alloy diaphragm, requiring precision manufacturing technology. This design delivers greater amounts of sound Information for smooth, extended reproduction. It also eliminates the effects of mechanical strain and adhesive bonding between separate components, preserving every delicate nuance of the sound. that combines the light weight of paper cones with the strength of resin cones. Surrounds are made of selected solid rubber. Together with the largediameter magnet structure, this assures tight,. deep, detailed sound for a superb listening experience. To maximize driving power, a square voice coil for the woofer driver Increases surface area by 27% and space factor by approximately 30% compared to conventional designs. This extremely rigid design enables the NS-F500 to deliver sonic information and sound quality above Its class. A speaker cabinet needs to convey the full weight of its sound output without any unwanted resonances. Because all corner areas need to be particularly strong, Yamaha employs its traditional three-way mitered joint construction, based on the use of a wedge along the joint. Slanted partitions and a vertical ladder provide additional bracing, for outstanding overall rigidity. The design even incorporates interior wooden blocks inspired by the bass bar used in violin construction. The result is pure, clear sound, free of any extraneous resonance. A speaker's physical relationship to the floor below it is one key to its sound. For this reason the NS-F500 utilizes newly designed spikes to assure a stable, optimal footing-another example of the lengths to which Yamaha goes in the pursuit of sound.